1. 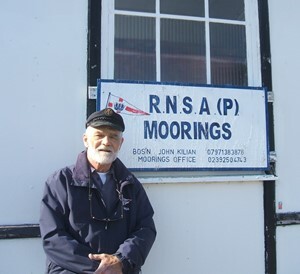 The end of the season is fast approaching and our illustrious Bosun, John Kilian, (JK) is formulating his winter berthing plan and is therefore keen to know owners intentions especially if lifting out for the winter. So please let him know if you are lifting out and when so the berth can be utilized when the swinging moorings are cleared. 2. Please remember that the 6 days a week RNSA launch service ceases on Monday 1 October and thereafter the Mon to Fri regime comes into play with JK working from the Main Office but still contactable on the mobile number 07769 204873. Please store this number in your phones. 3. The intention is to start bringing boats off the swinging moorings from October and put them onto other berths as they become free when boats go ashore for the winter. If you are intending to sail through the winter please let JK know. 4. Finally berth holders attention is drawn to the Lift Out deals that are available now at Hornet Services Sailing Club and Port Solent. Details can be found in other news articles, on the website or by calling into the office.